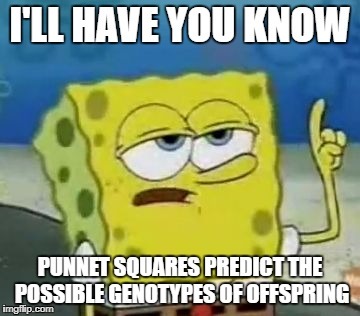 With a little help from everyone's favorite Porifera, SpongeBob Squarepants, today students practiced using Punnett Squares to predict the possible offspring of the cross of any two organisms. Punnett Squares have been around for more than 100 years and are a classic tool for making predictions about genetics. You can download today's activity below, the accompanying video can help you with solving Punnett Squares. Gold Tape Question: Who are Punnett Squares named after and what is the name of his famous 1905 genetics textbook?